If you followed along with Facebook and Twitter, you already know the outcome of the big stuff. The English-Only ordinance was repealed, and Kirby’s Law passed (he even took ownership of it and claimed it for himself). Now, like all the other counties in Maryland, council persons in Frederick County cannot bid on contracts with the county. There was some kerfuffle–is that an English word??? Who cares! Yay!–wherein some of the usuals tried to explain how unfair this was that Kirby didn’t know when he took the county job that he wasn’t going to be able to profit from the gig. Tony tries to suggest two amendments, but that nonsense was quickly laid to rest. Boo-hoo. Go ahead and resign. Dare ya. Being in-house this evening was something else. It was simultaneously easy to feel sympathy for teachers and teenagers. Like being transported back to the throes of adolescence, the “Am I hearing this right?” sensation of sitting and struggling (not altogether successfully) to respectfully listen to someone try to stick a square peg of an idea into a round hole of logic has not become easier with maturity. As an example, Billy Shreve was proud of himself for a “gotcha” moment this evening that involved vilifying the county for the expense of pursuing people who steal water from hydrants. This was after it had been pointed out that it has the potential to contaminate the entire water supply and poison us all. Scary. Plus: cost benefits analysis, dude. Water. Ask California to help you understand. If Billy were to have his way, no one would be prosecuted for some spindly fine that he would deem too small to collect. What that number is could be anyone’s guess. I suppose it’s okay to committ misdemeanors here in Frederick. On the other hand, capable teachers everywhere must cringe to realize that no matter how many times you explain how the budget works with the BOE, at least three grown adult people with allegedly mature brains will never understand it well enough to strike it from their list of “conflict of interest” talking points. Props to Jerry Donald for pointing out that the English-Only ordinance was a loser from the right hand side, in that it created unnecessary and meaningless legislation to govern a free-market and constantly evolving language environment. Leave it to a teacher to go all debate team on it and show us he can rock it from the other angle. And finally, at long last. And we mean long. And we mean last. Chmelik has a new game. Move to repeal is a way for an already verbose guy to force us to listen to him carry on ad infinitum. zzzzzzzzz also, compromise, I do not think it means what you think it means. Previous postAugust 18th drinking game-the one we’ve all been waiting for! 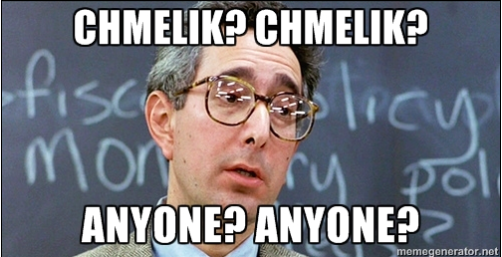 Yeah you are not kidding about Chmelik…he really likes to hear himself talk..however, he says nothing at all..word salad..